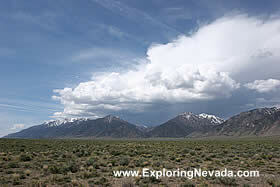 The Big Smoky Valley is a paved scenic drive in the heart of Central Nevada. The drive passes through the Big Smoky Valley, which is one of the larger surprises that a person is likely to find when wandering around Nevada. I know I certainly was surprised the first time I accidentally stumbled into this valley. You see, I was returning to Reno from a week spent in Las Vegas. Highway 95 passes through the small town of Tonopah, which sort of acts as a travelers rest station and is a good place to get gas (just don’t try the McDonalds there as it's beyond terrible!). In any event, I wasn’t paying attention and instead of going straight on Highway 95 north through town, I made a right on Highway 6 and started to head East. I had seen this highway before and had been interested in what was on it, so when I realized my mistake I didn’t immediately turn back. Instead I plowed on for a few miles. And then I remembered my map. Wasn't there a state paved highway that cut north just outside of Tonopah and led up towards Austin somewhere? So I stopped my truck and dug up my map and, sure enough, there is was - Highway 376 that led up through a valley called the Big Smoky Valley and through a tiny town called Hadley. Armed with this knowledge and a full tank of gas, I found the turn-off for Highway 376 a few miles outside of Tonopah, pointed my truck to the north, and headed into a place few people, even lifelong residents of Nevada, have never seen before. 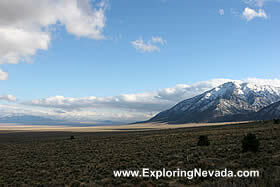 The Big Smoky Valley scenic drive follows the entire 100 mile length of Highway 376 in Central Nevada. This highway connects US Highway 6 (in the South) to US Highway 50 (in the North). Tonopah is the nearest town to the southern beginning point of this drive, while Austin is the nearest town to the northern beginning point of this drive. Starting from the South, the first dozen miles or so of the drive are rather boring, although the hulking mountians in the background do offer some tantalizing hints of what lays before you. To the left (or the west) when heading north are the Toiyabe Range, a mountain range with a massive vertical rise and which is home to the seldom visited Arc Dome Wilderness Area. And to the east are the Toquima Range, a mountain range that isn’t quite as impressive when visually seen from the road since they sit further back from the highway and have their western flank blocked a bit by foothills. The Big Smoky Valley defies all the conventional stereotypes of Nevada. The Big Smoky Valley is a big, massive valley that extends for more than 60 miles in length and averages from 5-20 miles in width - depending on where you are within it. The mountains, particularly the Toiyabe Range, rise abruptly off the valley floor and dwarf everything around them, with the taller peaks having a 5000 foot vertical rise. Unlike many Nevada valleys, the Big Smoky Valley does have people living here and buildings that are actually inhabited by something other than rattlesnakes. Three very small towns - Hadley, Carvers and Kingston - are located within the valley and along the scenic drive. Moreover, the Big Smoky Valley is host to a huge gold mine located right outside of Hadley that is impossible to miss when driving though, as the mine sits right along the road. Numerous side roads cut off from Highway 376 and head toward the mountains. Most of these roads tend to "start out good" before tapering off to 4x4 type roads as they enter National Forest lands. However, a few of these roads do have National Forest campgrounds on them. These roads are - usually - safe for all types of vehicles (at least until you reach the campground!). Trip Length : 100 miles (117 miles between Tonopah and Austin). Entire scenic portion of the trip is on Highway 376. Road Type - The road is paved for it's entire length. Side trips on gravel roads that range from excellent to poor condition. Services Available - Gas and supplies can be found in the small towns of Hadley and Carvers. The tiny town of Kingston also has a small general store. Tonopah and Austin, though, are the best places to get gas and stock up on supplies. General Location - Central Nevada. Trip follows the entire length of Highway 376, which connects US Highway 50 with US Highway 6. Camping - Most of the valley is public lands. So if you have a camper, pull over and camp where-ever. There is also a few National Forest campgrounds located on some of the side roads off of Highway 376. Look for the campground signs. The easiest campground to access is near the town of Kingston. Bring your tent or RV if you want to stay in the Big Smoky Valley or the mountains outside of it, as there is only one small motel in the valley that I'm aware of. However, in Austin and Tonopah there are a number of smaller motels. Tonopah also has a casino, too, that has lodging.